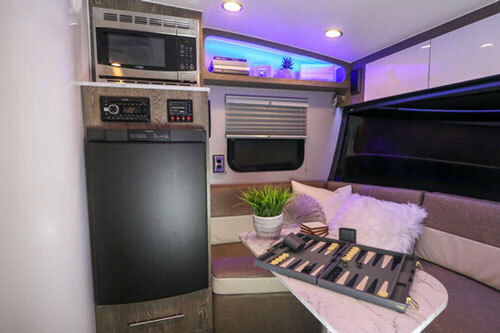 InTech Sol, medium-size, ultra-lite travel trailer meets towing ratings of most popular SUVs, but thanks to stylishness, thoughtful design, generous features and spaciousness – it gains popularity among RV-ers. After the success of series of Off-Road Travel trailers “Flyer”, followed by more-refined but still small, ultra-lite series of “Luna”, for 2019 the InTech RV released the new model of travel trailer – Sol. At first, Sol seems to be the extension of Luna (very-much appreciated by RV-ers for its quality and stylishness) as it shares many of its characteristics. 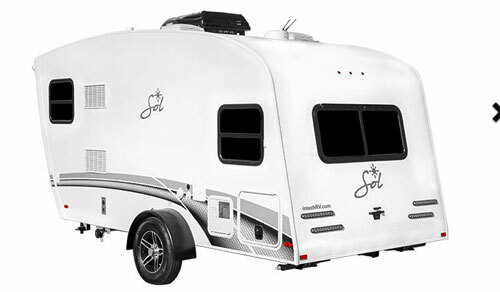 What makes however the Sol different from Luna is its size placing it in the category of medium-size travel trailers. 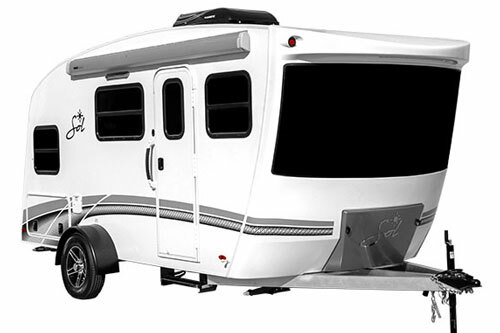 And with the size comes more features and amenities contributing to much more comfortable RV-ing. 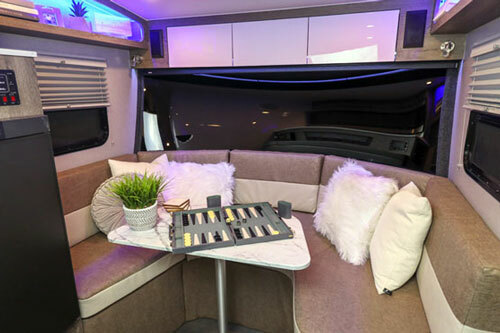 With its exterior length of 19 ft and cabin’s interior of almost 16 ft long, the Sol offers all vital elements of fully functional “home away from home”: spacious dinette, functional kitchen, rear sleeping area and wet-bath. Yet, thanks to modern, ultra-lite design, all this is achieved within the very reasonable UVW rating (3,050-3,200 lbs) keeping the camper in the towing range of most SUVs and light pickups. With the help of extra two side-windows (each can be opened) it is a bright and light open space virtually extending trailer’s interior into surroundings (hopefully the nature). The pull-down shade on the panoramic window and day/night pleated shades on side windows offer full privacy whenever needed. The dinette can be converted into spacious single bed (36” x 80”) or sleeping place for two kids. On both sides of the dinette, right above the windows there are cubby storages for small items (recessed, blue LED lights gave them very nice accent). On the front, above the panoramic windshield there is an overhead cabinet. Rotating table facilitates the access to the frontal part of the dinette and overhead storage. Another storage is located under the curb-side of the dinette (on the street side there is a battery box while under the central part – an accessible from the outside compartment for LPG tanks). Across the entrance door, next to the dinette section there is a large cabinet housing microwave oven, 3-way fridge w/pull-down freezer, entertainment section (Jensen’s AM/FM/CD/DVD/Bluetooth Stereo) and the large storage drawer just below the fridge. You will also find here Monitor and Control panel (water tanks levels, black tank heater, water pump, battery charge), battery disconnect switch as well as switch and fuse panel for Converter. Note that only the microwave and A/C unit runs on 110Vac (also available in few outlets throughout the camper). 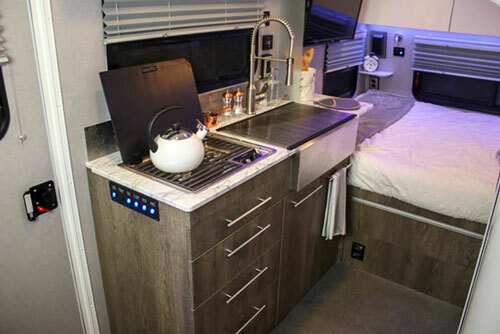 The galley includes 2-burner cooktop with iron grid and flush-mounted lid, large, farmer-style single bowl sink with cover and residential high-rise faucet with sprayer (note that sink’s lid can serve as a working space but also as the drainer). Large window as well as recessed lights makes the kitchen bright regardless the time of the day or night. Standing and overhead cabinets (drawers or open space) provide ample storage space. Due to space limitations, the countertop’s working area is quite limited (fully available only when both - cooktop and sink are covered with lids). Some help offers a small folding section of the countertop, but for obvious reasons it is not overwhelmingly changing the situation. The 110Vac outlet on the kitchen wall allows for using any extra kitchen appliance you may need (kettle, coffee maker, grinder, etc…). On the left side of the kitchen cabinets (right at the entrance) there is very handily placed light control panel. From here you can switch On/Off several lights including porch, front, dinette (under cabinets), ceiling and bedroom lights as well as blue accent lights throughout. Note that bedroom lights are controlled by 2-way switches, so they can be also turned On/Off from the bedroom. On the right side of the galley there is wall-mounted thermostat to control the roof-mounted 13.k BTU A/C, 16k BTU furnace and 4-speeds Fantastic Fun with motorized cover. The latter is equipped with a rain sensor so it will automatically shut it down and close when needed. 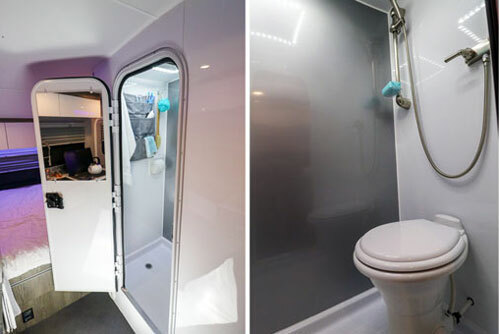 Across the galley you will find solid-wall (fiberglass) wet-bath cabin. While it is a sort of walk-in bath, in the limited space there is only room for porcelain toilet and adjustable shower head. The mirror on the door, pocket storage on the wall for toiletries and towel hook as well as skylight with fun, surely makes it practical, but the lack of vanity with sink is obvious. The queen-size bed makes the sleeping area at the rear of the trailer. As expected for this size RV, the bed is tightly fit with access only from the center. But designers did everything to make it as comfortable and practical as possible with two small shelves and speakers on both sides, reading lights that can change to blue creating peaceful ambiance, 110Vac, 12Vdc, USB ports and 2-way switches controlling ceiling lights. As for the storage – InTech did not space efforts to fill each available corner for shelves, overhead cabinets so you will find them also here. On top of that – the large wardrobe with hanging bar offers generous space for shirts…. Large rear window and two opening windows on both sides of the bed make the rear area bright. 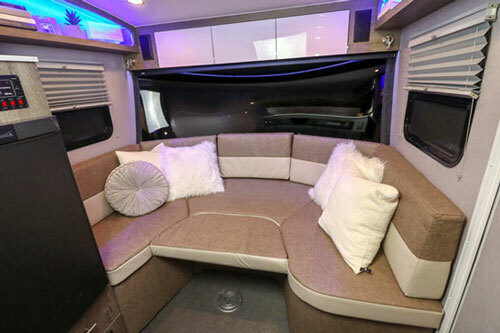 The 32” TV is locked on the curb-side wall above the bed, but thanks to the swivel arm, it can be watched from the comfort of dinette at the front. Moving outside - the optional slide-out kitchen seems to be much better choice than otherwise an extra storage compartment. 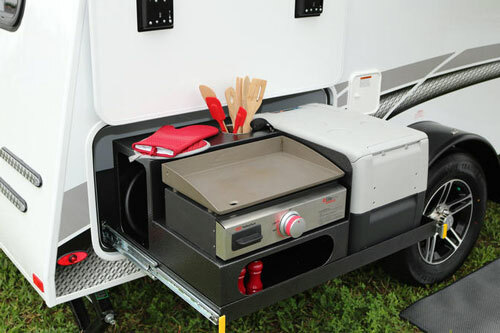 Equipped with grill, small basket for silverware, 110Vac and 12Vdc receptacles as well as an extra LP connect it is designed to serve the purpose – an outdoor picnic under an umbrella of the Thule awning. If needed, you can also opt for ice-box cooler or real Dometic fridge that can be also se set as freezer. The entrance with its one pull-up step and grab-handle (both with LED lights), 2” rear receiver for bike rack and LPG compartment at the front prove design’s thoughtfulness. Note: Check with the manufacturer and/or authorized RV Dealer for the up-to-date list of features, options as well as latest specifications. These written above may not be accurate and certainly are subject to change by the factory. We are not responsible for any inaccuracy, the above text is provided only for the general information.